To clean windows effectively using the reach and wash system the first thing that’s essential is that we have a system to purify the water adequately. Purified water is the removal of contaminants we find in tap water, these contaminants are suitable for drinking water due to having the correct mineral composition that humans need; including calcium and the likes of magnesium. However when cleaning windows we must remove these dissolved solid particles otherwise they will lead to spotting on the glass and dry stains on the glass. The two main forms of purifying window cleaning water are through Di ionisation vessels and through reverse osmosis. For areas that are termed ‘soft water areas’ ie their tap water reads at 100ppm (PARTS PER MILLION) or less, these window cleaners will often use DI vessels to purify the water. This includes the use of tap water entering their vessel and leaving the vessel pure; the magic happens in the vessel itself. This vessel houses resin, which looks very much like sand. This ion exchange resin changes the ion charge of soluble parts in the water itself. The resin is made up of polymer spheres, and these spheres remove hard spots such as magnesium from the water due to the insoluble acidic and alkaline chemicals they transfer. The water comes out the other end of the di vessel purified, and window cleaners will change their resin once the PPM (PARTS PER MILLION) reaches around 5. For window cleaners that live in ‘hard water areas’ they have to rely on reverse osmosis to turn their water pure, namely due to the cost involved if they were to use the above resin method, they would simply burn through resin at an alarming rate. Reverse osmosis is a system that uses semipermeable membranes to remove large particles from tap water. This system usually has two filters, one of which is a pre filter and often known as a carbon filter. In very hard water areas it is not uncommon to have a DI vessel at the end of this system, used as a ‘finisher’ and bringing the now very low PPM reading down to zero. depending on our needs. Here is an image of a window cleaning vans interior, this system is purpose built to carry and control the flow of purified water. We use specialist equipment designed for window cleaning, to clean windows. 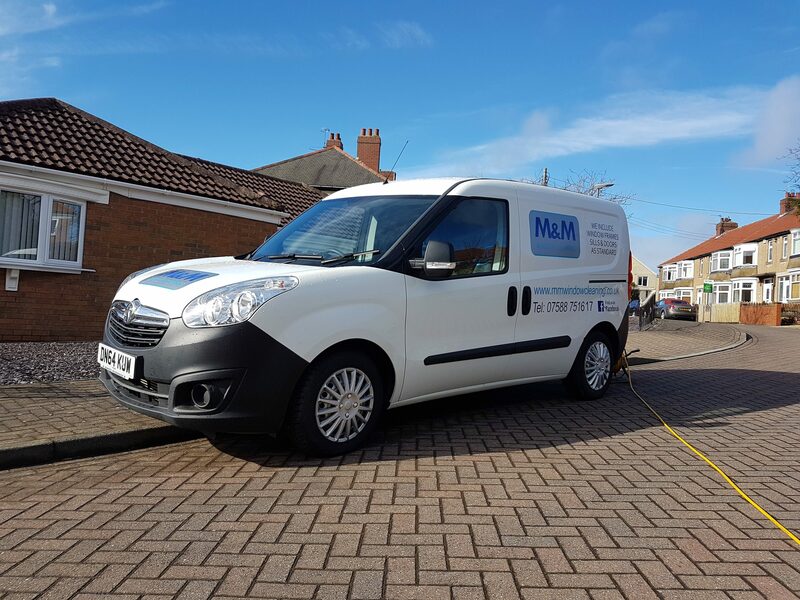 You may notice that window cleaning vans have lines of coloured hose coming out the back of them; and this is transferring the purified water from the van system to the telescopic poles we then use to brush the windows clean. There are a variety of poles and styles on the market today but the theme remains, the poles are collapsible and can be extended to reach heights and angles that ladders never will. On the head of these poles are window cleaning brushes, which are varied in designs. I personally chose a sill brush as my first one, because this has a very wide angled set of soft bristles that allowed me to get into all the sides of the window frames on the initial cleans. What you can expect on a first clean is for us to set the tone for all ‘maintenance cleans’ (the cleans we continue to do for you down the line), and by this I mean the first clean is very thorough. We start by scrubbing the frames of all dirt, returning them to a clean and sterile state (after all we don’t want the purified water to splash on dirty frames and contaminate your clean windows). We then clean around the vents if your window has any, because we know that this is an area of the window that traditionally is very hard to maintain previously. To agitate the dirty glass we will give it a light scrub initially, loosening all hard marks. We rinse over the frames in an ‘s’ shape, from top to bottom and finally come back to the first window and use the same rinsing technique but only on the glass for the final rinse. Because we have purified water in our system, not only will your frames be cleaned very thoroughly by us each time but your windows will dry spotless. We finish by scrubbing the window sill.